Your child deserves the best the world has to offer. 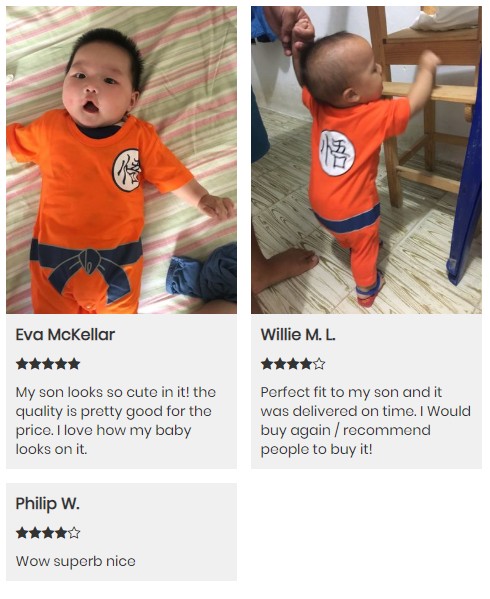 Well, nothing could be cuter and lovable than a baby wearing Dragon Ball Goku Baby Costume. Crafted with super soft cotton and lots of love, this hooded cotton baby romper will keep your baby cozy and comfy. It’s cute, it’s cuddly and oh-so-soft! Let the journey to becoming the greatest martial artist begin. 70 7-9 M 55 cm/21.65" 52 cm/20.47" 37 cm/14.57"
80 10-12 M 58 cm/22.83" 52 cm/20.47" 40 cm/15.75"
90 13-18 M 62 cm/24.41" 60 cm/23.62" 43 cm/16.93"
95 19-24 M 64 cm/25.5" 62 cm/24.41" 45 cm/17.72"
My son looks so cute in it! the quality is pretty good for the price. I love how my baby looks on it. Perfect fit to my son and it was delivered on time. I Would buy again / recommend people to buy it! This is one awesome costume! 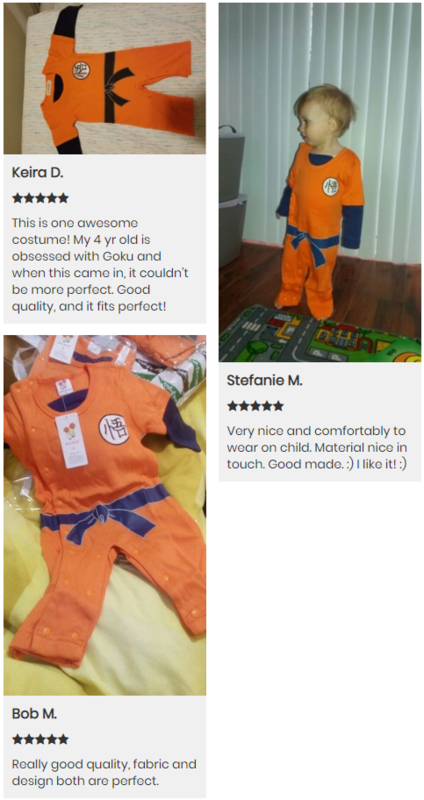 My 4 yr old is obsessed with Goku and when this came in, it couldn’t be more perfect. Good quality, and it fits perfect! Really good quality, fabric and design both are perfect.